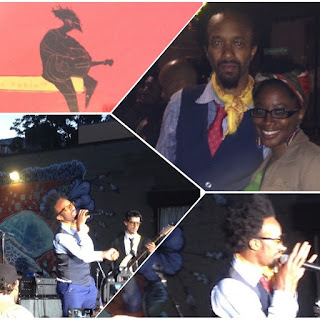 You must, you must, you MUST buy Fantastic Negrito's album The Last Days of Oakland. Some of you may have heard of Fantastic Negrito when he beat out 7,000 people in a music contest for NPR. I saw him perform at a private party and he rocked the hell out of the stage. I went home and bought his album immediately. My friend bought his CD right there. Fantastic Negrito is a blend of blues, roots, punk and rock. He recently performed on Empire. His new album The Last Days of Oakland is about gentrification, racism today and hardships of the working class. He performed live on Friday night for Oakland's monthly First Friday street fair. I rocked out. I get tired of songs about the club and womanizing. His lyrics have depth and many people can relate to what he's talking about. I'm glad I got a photo with him before he really blows up. I'll have some special news about Fantastic Negrito very soon. I'm excited!